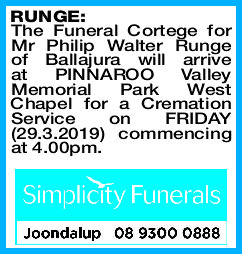 The Funeral Cortege for Mr Philip Walter Runge of Ballajura will arrive at PINNAROO Valley Memorial Park West Chapel for a Cremation Service on FRIDAY (29.3.2019) commencing at 4.00pm. Passed away peacefully aged 71 on March 25th 2019. 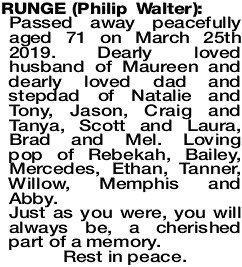 Dearly loved husband of Maureen and dearly loved dad and stepdad of Natalie and Tony, Jason, Craig and Tanya, Scott and Laura, Brad and Mel. Loving pop of Rebekah, Bailey, Mercedes, Ethan, Tanner, Willow, Memphis and Abby. Just as you were, you will always be, a cherished part of a memory. 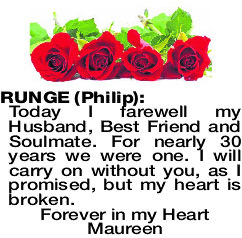 RUNGE PHILIP Today I farewell my Husband, Best Friend and Soulmate. For nearly 30 years we were one. I will carry on without you, as I promised, but my heart is broken. RIP Wally. Dear friend to Thais, Graeme, Lynette and Edward. 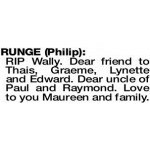 Dear uncle of Paul and Raymond. Love to you Maureen and family. 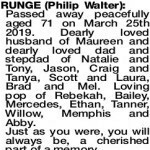 RUNGE PHILIP WALTER Much loved uncle and brother-in-law who will be forever in our hearts. Rest in peace Wally. Deepest sympathies to Kevin, Maureen and family. Siobhan, David and Patsy. Great friend of Bev, Chas and family. Our love to Maureen and family.